Are you looking to buy Custom Glass Doors Houston? Whether for interior or exterior use, these doors add a lot of elegance to a home. If you are thinking of renovating, you should consider upgrading to glass. These doors can be energy efficient and raise your home’s value. They can also increase the amount of enjoyment you get from your home. Homeowners worried about privacy can always opt for decorative or opaque glass. This style of door is easy and inexpensive to clean. There are a few myths about exterior and interior glass doors. These myths often prevent consumers from getting the perfect door for their home. In most cases, these mistaken beliefs were once true. Modern technological advances have made glass doors a practical and attractive choice. Learning more about these types of doors can help you decide to upgrade to glass. Homeowners in the U.S. and Canada can visit Southern Front for their custom glass needs. Southern Front has a wide selection of custom glass available in many patterns and styles. Southern Front should be your first stop for interior and exterior glass doors in Houston. You can view their current products online at http://www.southernfornt.com. Interested customers can also contact them by calling 281-890-5860. They are happy to discuss any concerns you have about upgrading to glass. Take a look at the information below and contact Southern Front for more information. Many homeowners believe that interior glass doors are not safe. Parents and people with pets in particular may have concerns. These fears do make some sense. Glass does tend to be more fragile than other materials. It can seem like a big risk, especially if you are upgrading from wood. Even if you prefer the look of glass, you may still wonder if it’s worth the gamble. After all, you should never take unnecessary risks with your family’s safety. The good news is that modern glass doors are very strong. Though, of course, wood will always be sturdier. There are many ways to treat glass to make it durable and less hazardous. Most retailers have tempered, impact-resistant glass available if breakage is a concern. New glazing techniques can also help make breaking glass less of a concern. If you do have pets or children, speak with your retailer about these concerns. There may be a style or design that can give you extra peace of mind. Customers interested in custom interior doors can visit Southern Front today. 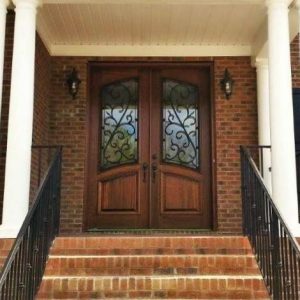 Southern Front does have a wide selection of premade doors available. They are also happy to discuss custom options with their customers. If you have safety concerns about glass doors, speak with a sales representative. You can contact Southern Front by calling 281-890-5860. Consumers can also find them online by visiting http://www.southernfront.com. Before you call, make a list of your concerns. This can help the sales representative address your own specific needs. Some homeowners hold off on replacing their exterior glass doors in Houston for as long as possible. They may believe that replacing these doors is time consuming and expensive. For many people, it might even seem like it is more trouble than it is worth. The potential payoff of an improved entryway is not always incentive enough. In reality, replacing your exterior doors is not only a cosmetic move. This type of renovation can save you a lot of money over time. Many doors have insulated cores. This helps them keep the elements out. As a result, your home becomes more energy efficient. Replacing your doors can also increase the amount of enjoyment you get from your home. Falling in love with your home again is priceless. If you want to upgrade to custom exterior glass doors, contact Southern Front. They have a wide selection of glass and frames from which to choose. You can browse through available stock online by visiting http://www.southernfront.com. Prospective customers can also call them at 281-890-5860 to learn more. Cost is another factor that keeps some people away from buying custom interior glass doors. Glass doors can seem like a huge investment. By the same logic, custom glass doors should cost even more. For people renovating on a tight budget, this worry can prevent you from getting the perfect door. As long as you buy your doors from a reputable retailer, custom doors are not much more than traditional ones. Custom glass doors are often comparably priced against other premade models. They do look sophisticated and elegant. Custom glass can also add a lot to your home’s value. Despite these huge benefits, they are not as big of an investment as many believe. If you are looking for custom interior glass, visit Southern Front Stained Glass and Doors. They have a wide selection from which to choose available at affordable prices. You can view their collection of glass doors online at http://www.southernfront.com. Customers interested in custom options can call 281-890-5860 to learn more. Southern Front is happy to ship to homes across the U.S. and Canada. There is no reason to shop anywhere else for your custom glass needs. When looking for custom exterior or interior glass doors, be sure you shop from a reputable retailer. You want to know that the door you buy will last a long time. This is of particular importance if you are buying out of state. Look for a company that offers warranties and has an agreeable return policy. When you browse around, ask the retailer questions about their products. It is important to know you are going to get a durable, quality door. Consumers interested in learning more about custom doors can contact Southern Front. They have many years of experience selling custom glass and wood doors to customers across the country. You can view their available products online at http://www.southernfront.com. Consumers interested in custom doors can contact them by calling 281-890-5860. If you are in the market for custom glass doors Houston, contact Southern Front first.